GANDHI ? WHO'S THAT ? All the educated people anywhere in the world knows about Gandhi , I am sure . Apostle of peace of the twentieth century who led one fourth of the mankind to freedom from slavery , exploitation and colonisation through totally peaceful means , the way world has never experienced !!! 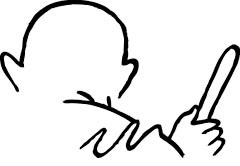 Not only limited to Indian sub continent , Asia or Africa , Mahatma Gandhi is revered as a symbol for peaceful means of struggle to get one's freedom and recognition among Americans and Europeans as well to this day ( latest being President Obama's election campaign speech , 4 weeks back) . But do you know that the 'famous' Nobel Foundation never officially recognized him in his life time and thereafter till this day? How come that ? Is it deliberate or just a 'miss' ? Is it fair from the side of an institution as 'noble' as Nobel Foundation to have closed their eyes all these years in this respect? I am an Indian . A proud Indian . Nearly 30 years' of my overseas life has strengthened 'Indian' in me , simultaneously along with increased respects for others, after meeting , interacting and living with thousands of others, travelling widely the world over. Having said that , here I have tried my best to be a non biased reviewer of the facts on this subject , which are based all from authentic sources including from Nobel Foundation documents . Nominated 5 times , yet.. It is not that Nobel Foundation did not identify him . He was . He was nominated for Noble prize for peace 5 times - in the years 1937, 1938, 1939 continuously and then in 1947 . Last was in 1948 , 2 days prior to his assassination . Each time for some strange reason he was not picked up ﻿as the winner . Gandhi was one among the 13 candidates in the short list prepared by Norwegian Nobel Committee that year. Prof Jacob Worn-Muller who was the appointed committee advisor summarised his report on Gandhi " He is a freedom fighter and a dictator , an idealist and a nationalist . He is frequently a Christ but then suddenly an ordinary politician ". He also doubted Gandhi's ideals were meant to be more Indian than universal . He accused Gandhi that his struggle in South Africa was meant for Indians and not for the blacks whose living conditions there were even worse ! Instead of Gandhi , that year the authorities decided to give the laureate to Lord Cecil of Chelwood of Great Britain. Both years Gandhi was nominated but he was not even short listed ! Interestingly only one Norwegian parliamentarian Mr. Ole Colbjornsen nominated Gandhi all three years of 1937, 1938 and 1939 ! This time he was short listed .Nobel Committee Advisor Mr. Jens Arup Seip made the report on Gandhi . The report was not critical of Gandhi as in 1937 but was not supportive . Poor Gandhi ! 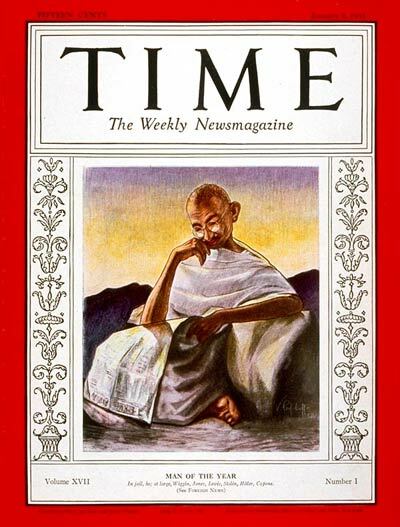 Gandhi was assassinated on 30 Jan 1948, two days prior to closing date of nominations for Nobel Peace Prize . The committee received 6 letters of nominations for Mr.Gandhi including from Quakers who was awarded with the Nobel Prize for Peace in 1947 and another laureate Emily Greene Belch ! Gandhi was considered along with two other names. This time the report summarised thankfully as " Gandhi can be compared to the founders of religions" . As per the statues of the Nobel Foundation posthumous awards can be given under certain circumstances , hence it was possible to give Gandhi the Nobel prize . But in spite of this he was not given. The committee that year rejected Gandhi's nomination with a strange finding - Posthumous awards should not take place unless the laureate died after the committee's decision has been made !!!! (Later Mr. Dag Hammerskjold , Swedish diplomat was given the Nobel laureate posthumously in 1961 under the pretext that he died after committee has decided!) . Instead in 1948 committee decided to make no award that year for the Nobel Prize for Peace on the grounds that " there are no suitable living candidates"!!! Until 1920 Gandhi was known to only India , South Africa and Britain . 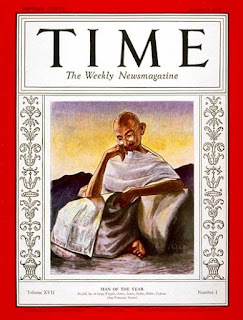 But then the news of Gandhi's struggle in India has started spreading to rest of the world- slowly but steadily , understandably so being those years the communication net work was not modern as of today plus he was hailing from a European colony . While some of the European renowned free thinkers , scientists and writers were attracted to his personality and his unique movement of ahimsa and satyagraha , few opposed , but many doubted ultimate outcome of his actions- independent India through peaceful means, which included few noted Indian leaders as well . The biggest opposition to him was from obviously the British, although from not all . Churchill hated him and his peaceful disobedience to such an extent that it is told that he favoured letting Gandhi die if he went on a hunger strike. When the British were forced to invite Gandhi to London to have talks for the first time in 1931, Winston Churchill told publicly " It is alarming and also nauseating to see Mr.Gandhi , a seditian Middle Temple lawyer , now pose as a fakir of a type well-known in the East, striding half-naked up the steps of the Vice-regal palace to parley on equal terms with the representative of the King Emperor " .Churchill never wanted to give up India, jewel of the crown under any circumstances and expressed his undiluted hatred for Gandhi who lead a movement exclusively for that . History taught Churchill and others how Gandhi out grew the Emperor himself in popularity among the world masses in the following years . In a way Churchill was correct in the prediction , Britain who was the epicentre of world powers, steadily lost that position since 1947 , when India gained her independence . Nobel Foundation never awarded Nobel Peace Prize since its inception to an Asian till 1960.Till then , for the 112 years it was exclusively reserved for the Europeans and Americans . This could have been a reason - Gandhi was from Asia and from a colony of a European country...a sort of racist sentiments could have worked out with some. Another reason could be the Nobel Committee did not want to antagonise Great Britain , the world's most powerful nation (at that time) against which Gandhi was leading the struggle for freedom. Nobel Foundation might have under estimated then, how much Gandhi and Gandhism would be influencing the world in the years to follow . One cannot pin point the exact reason behind , since all those involved in the matter in the Nobel Foundation in no more . The omission of Gandhi has been widely criticized since then including some the committee members who succeeded . Most of the Nobel Laureates for Peace since 1948 have explicitly made their points over the absence of Gandhi in the list, making the Nobel committee continuously embarrassed . Not long after Gandhi was 'ignored' , Nobel Foundation might have had the impact of it ,which must be still on. 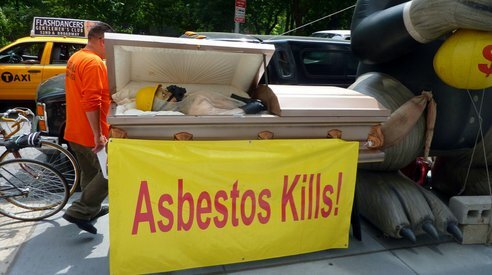 In order to contain that Nobel Foundation has taken many actions for the 'damage control' over the years. Nobel Foundation has posted in their web site a very lengthy article titled ' Mahatma Gandhi , the missing Laureate ' trying to explain how it all happened. 'Eye on Gandhi' an exhibition of archives at Nobel Peace Centre, Oslo try to convey the visitors how Gandhi was nominated many times and " might have won the prize in 1948 had he not been murdered" ! When Dalai Lama was awarded the Peace prize in 1989, the committee said that this was "in part of tribute to the memory of Mahatma Gandhi . The intentions of all these corrective actions of the Nobel Foundation are to be appreciated but definitely it falls short of the terrible but corrigible lapse it has committed . In 2006 , Gier Lundestad , Secretary of Norwegian Nobel Committee said " The greatest omission in our 106 year history is undoubtedly that Mahatma Gandhi never received the Nobel prize . Gandhi could do without the Nobel prize whether Nobel Committee can do without Gandhi is the question ". No is my answer . Nobel Committee cannot continue to remain with its glorified intentions without Gandhi in the list for years to come. The gap will get enhanced in geometrical progression as years go by in spite of explanations in the web site and permanent exhibitions of explanations. One cannot put the clock backwards . One cannot redo the history . But one can correct the mistake of the past with the present . I wish Nobel Foundation would do now in case of Gandhi , what it would have done if it had omitted Albert Einstein in the list of laureates for Science . 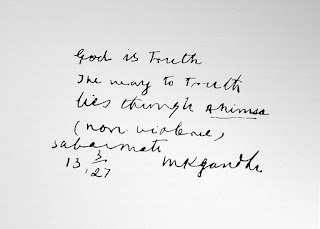 No one can just miss or ignore a person about whom Albert Einstein wrote "Generations to come will scarcely believe that such a one as this (Gandhi) walked the earth in flesh and blood " . 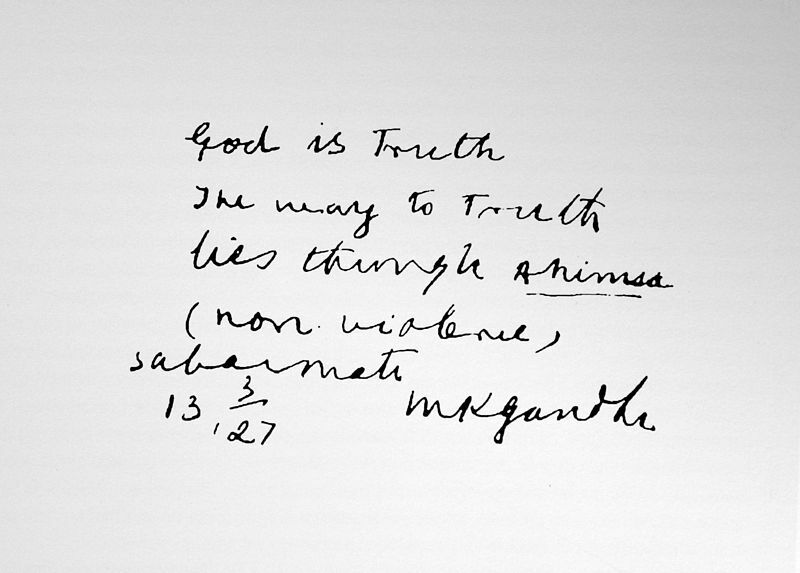 Satyamev Jayate , Truth only triumphs ! As a teenager , during pre Internet, pre TV days , I used to enjoy James Bond movies because of the action , presentation of new 'scientific gadgets' , scenic and exotic locales and beautiful girls. Still I do , Skyfall being the latest. It was scenes of one of such movies that enchanting beauty of the Greek islands' was registered in my mind for the first time . Prior to that , I have vague memory of scenes (photos) of those islands, while I was in school , which has come in travelogues published by Readers Digest, my appa used to subscribe. When the cruise liner Playtera Ton Ouranon left the shores of Athens , it was house full . Mostly European crowd from Spain , Italy , France and Balkan countries . From Asia it was mostly from Korea . Few Americans . Hardly any Indians . Surprisingly more than three fourth of the crowd in the ship was upper middle aged /old ladies of different shapes and sizes - as if there is a conference for such in one of the islands!! ( യൂറോപീന്‍ അമ്മിചിമാരുടെ സംസ്ഥാന സമ്മേളനം ? )Thankfully they were all decently dressed!! Aegean sea was calm , slightly cold breeze was blowing. The ship was a typical vessel used for such purposes , a bit old but well maintained . It comprised of three decks - the upper , the level 1 and lower deck where the dining is located . Passengers can sit and rest any place as they wish or move around , lunch included . All beverages /sandwiches/water are to be paid extra, for which outlets are conveniently located in all floors. Hailing from Kochi , sea and ship is not something new for me .First two hours was boring for me , since the ship was cruising in the mid sea with no land to be seen near . . May be to contain that , the ship had arranged live music and dance in the upper deck during that time . But as we came nearer to different islands , the scenario changed . Tens of islands started to emerge from no where . Hilly landscape with not so thick vegetations. It seems there are numerous islands in Greece . Some are habituated but many are not ,all earth quake prone areas. Each island is different to another in life style , I am told. As we approach the island , the scene of a natural horse shaped harbour - full of old fishing boats and modern yachts, lined up with shops , taverns and restaurants , mostly single storied , narrow stone laid curved roads going up to the hill , old typical Greek villas located in the hills - is definitely something any one will enjoy. As we got down and walked , the scenes became more enjoyable . Each building whether a shop , bar , hotel or home has its charm .No wonder a lot of Hollywood movies are filmed here including one of Sophia Loren . One old church building was standing out among the others , which all stood in harmony with the landscape . There are no cars or buses in Hydra . Means of transportation is either by donkeys or bicycles .Of course one can walk. Population is around just 3000. Harbour is the heart of the village .We could see a fisherman selling his catch live in a boat. A family of mother and two children were fishing with rods right in the harbour . As we walked to the museum , a statue is prominently displayed - around which local children were playing with the old guns - that of an admiral who played a major role in Greek war of Independence , who was born in that island. Poros is another picturesque island . The harbour road is lined up with cafes, taverns and restaurants . Orange trees are planted in a row by the side of the harbour which again full of yachts and fishing boats. Slightly bigger and busier than Hydra , the population is less than 5000. A historic clock is imposing on the highest point below which there is a sort of court yard . For some reason for me , Hydra looked more closer to nature than Poros. Aegina is an island not far from Athens . It was a sea power in the by gone era which was a rival to Athens.As the cruiser approaches the island , the scene is just beautiful . The harbour is lined with shops and restaurants ... with a church having typical Byzantine arch dome for the roof , against the background of rocky hills . After hoping into a bus , which is part of the cruise , we were driven to the hills for sight seeing. As the Volvo bus started going up the hill through the narrow but good roads , one will be attracted to view vast olive and fistiki gardens . Pistachios here , the guide spoke in length, is one of the best in the world , can rival those from Iran and surrounding countries in quality and taste. The cultivation of the same is here since 1896 . Fistiki of Aegina has become so important to Greece that every year a Fistiki Fest is conducted attracting all from the rest of the world during harvest time.In 1996 the name Pistachio of Aegina was registered in the EU gazette as a Protected Designation of Origin (PDO). Dilapidated pre christian temple of Aphaea can be seen on the hill top but what I enjoyed more than that is the view from the hill .Simply stunning as you can see below . Another attraction of the island is the church of Saint Nektarios , with its magnificent Byzantine architecture. Greek in general are orthodox Christians and unlike in some other parts of Europe , they are theists. After few minutes when we boarded our cruise ship to get back to Athens , wind started blowing and waves rising . All passengers were told to get inside the halls and the doors were kept locked. The ship started swaying , to not that normal levels .To make matters worse , they were playing the title song of the film 'Titanic' through the loud speakers for some reason ! Geetha looked a bit uncomfortable and showed the same on her face . I was in the same state but did not show it . It was almost the same situation until we got back to main land. As we climbed down the ladder from the ship the captain and the first officer were standing by the side, smiling and telling each visitor "Thank you. Good night". When our turn came the officer told us " Good night .Namasthe" with folded hands. Mr. Nicholas Economobulous, chauffeur of the limo van , picked us up from 'Grande Bretagne ' at the exact time to drop us at the airport , the way he had collected us when arrived , he was in a conversation mode . He replied to me my general questions about the past and current status of Greece in acceptable English and contents . Finally when I asked "What do you know about India ?" His answer was crisp . "I know that it is a large country with large population .That's all ". But he then loudly said as if he knows something more about India ." Yes, I have heard about TATA " . Although India has not marketed well , Tata has marketed his company in Greece well, it seems ! Before we parted at the airport he asked us "Did you enjoy Athens?" We confirmed affirmative. He continued politely. "I am glad to hear that . We want every visitor from outside world come to Athina ( Athens) and enjoy the land ". Sure, Athens assures that to any visitor. Note : All photos are clicked by me . What is the definition of your dream job or career ? Define it now precisely . "A job with excellent salary/ perks, limited working hours and little or no responsibility " - if this is your definition , you better change your definition because such executive jobs does not exist in business . Your career should be your passion , your love . The more you are attached with it the more you should be able to enjoy . Naturally being positive and demonstration of such an attitude is essentially one of the keys of career growth. I am of the opinion that this attitude reflects in one more by birth but can be trained to a reasonable level by practice . Being positive is highly influenced by the circumstances one is brought up or one works . To put it in one sentence , positive people look for solutions while the negative people see only obstacles when confronted by a situation or problem . Always be positive , ambitious and confident in life and work. One should clearly understand the difference implied in this . Working hard is fine but ensure that what is expected from you is delivered in time . Timely delivery of your job/assignments/target is essential for your career growth . Keep the timings sharp . You can be rest assured that without this being practiced no one has come up the ladder or could have gone more faster had this in place. Knowledge is power , everyone knows this but I may add up - information is success. Well, one has to be definitely knowledgeable but keep abreast of what is happening in the world . Prime time spending in this direction can be given to the field of one's own career , but do not limit to it . Try to spend at least half hour daily to read something you do not know other than routine stuff in newspapers , periodicals and net. Refresh your skills . Let us consider the cases of two individuals , graduates from the same Alma mater in the same year , having more or less same grades . I can assure you that one who keeps informed will out smart the other by 100 % in ten years! Right information , at the right time , in the right direction hits the bulls eye always . Graduates having lesser grades while in college or those from not-so-known-schools/institutes overtake those who come out from premier institutes can be attributed to this reason . What ever be your age you have to be physically and mentally fit to deliver what your management looks for. Good eating habits and regular exercise will give you the physical energy . Be reliable .Be trustworthy. 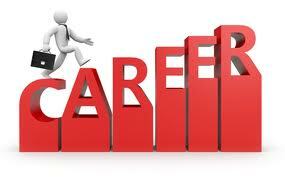 If you are looking forward for your growth in career , do not compromise on this matter. Be reliable to your own junior staff , colleagues, management , clientele . Before you say 'yes' to something , big or small - a contract , a request - try to fathom the implications . If the request is unrealistic from the other side , politely address it . But stay committed to what you have agreed. For some reasons , beyond own control if you cannot meet what you have committed , please apologise earliest possible and get a revised date or time .But ensure that this is not repeated very often and remember that such a revision cannot be done in many occasions. 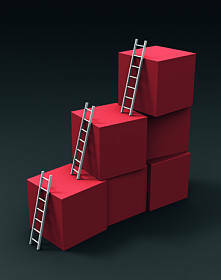 Any thing good and worthwhile can be shrouded with risk .Growth and success in career comes along with risk to be taken . Believe in yourself . Be confident .Take risks to the level it can be taken . Professionals can be with different opinions but I would not advocate to take ' blind risk' in your career but to a level of ' calculated risk' , which can help you. When problems arise when quick and effective decisions are to be taken , study the problem well , study the pro and con of the issue , draw a line to the level one can go with calculated risk and go ahead identifying clearly the risks taken . It is more likely that you go through what you want than not. If you are waiting for your senior to take the risk part or you think you are not paid for that , then you are not eligible to be a senior. This is where almost everyone slips . For any successful organisation there should be a system for working. While falling in line with the system , let it not restrict you to work the best of you . Mentors and bosses can guide you but you must be your own manager . Regardless of the prescribed working hours and environments , if one has to go a bit further to achieve what the management looks from you , do that .Volunteer. Always mind the following golden rules , which everyone knows but rarely practices . * Share the credit with others . *Offer solutions to the problems while you must take to the boss. *Stop comparing yourself with others. *Be patient enough.Keep producing .Any intelligent management will notice for sure a job well done and recognize even if it can take some more time , at times. Focus on long term goals . *Don't talk bad about your boss ( even if he is bad)or company to anyone if you intend to continue your job there. Doing that to your own colleagues could be 'harakiri' . *Appreciate good job done by others in open and loud , do exactly opposite in case of a bad job done . Now that you have read this article , relax and try to fully understand each point once again and get it digested in full . Please review with what you have been already practicing and what you haven't .. If you think you have to make changes in working style , do that . If you think I have to amend the points , you can suggest !! It is exactly a year since Thavo, my elder brother passed away. Ravipuram is the location of cemetery in Kochi city where his body was buried,63 being the tomb number. In fact my first posting 'Adios Chatten ' was published in this blog soon after he died last year. Expect the unexpected! I did not, when we landed in Kochi in end April 2011 prelude to betrothal of Vinay, our eldest son.We had to get ready for the happy occasion and a lot of arrangements had to be done during the 2 weeks left.Sure, we can cope up within the short time left,I thought since Kochi is my home town plus my brother is always there to support in these matters.But something else was in store for us. 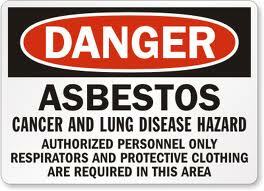 Following pain in the abdomen which was bothering him for sometime,after a series of tests, my brother was detected of lung cancer! !It was confirmed 2 days prior to the event.I decided not to reveal to him or anyone else till the betrothal is over (except Geetha and Vishal.Vinay, who is a doctor played a pivotal role then and thereafter). I had to go through very very difficult days ..although by and large nobody noticed,few close to me asked whether I am alright, could be seeing my facial expressions!Two days like I never went through in my life! During those two days in fact I was planning how to reveal the truth to my brother and other immediate family members,how to get them(and myself) ready to accept the unexpected situation,how to cope up with turn of events - medically, financially, physically, socially.....The very next day of the event , I did as rehearsed myself - presented the issue and as advised by Vinay actioned for immediate treatment with the best expert in the state. He died six months later. Curtain was drawn all of sudden,quite unexpected,to our intimate, unique and close relationship as friends and brothers which spanned for 61 years on 16 Oct 2011! Some of our relatives and friends used to call us ' aniyan bava , chatten bava ' - 'Like elder brother,like younger brother' after a popular Malayalam hit film.Few musings in this occasion. I did not tell him that I have spent hours and hours in Internet to know about his dreadful disease ever since it was detected till the last day...searching for any possible remedies and more to find out the state of mind of a patient in such cases. I did not tell him about the 'helplessness' I felt myself being beside him in the hospitals , especially when he used to suffer with severe pain . "As if someone pokes on a open wound with a pencil " , he defined his own pain to me when asked once!I did not tell what he had told me to any of the kith and kin either then. I did not tell him that I have quit smoking myself on the day his disease was diagnosed and confirmed.Over 40 years of being a moderate smoker I stopped myself overnight.Since then, not only that I did not smoke but I never had the craving till this day! I did not tell him about the sad demise of our common friend Gilbert who went through similar circumstances almost at the same time. Last we met him was in the oncology dept of Amritha hospital when I and chatten were there.I was the lone witness of a meeting of two close friends in a place where we never thought would take place! What I have learned since then .. I have learned that anything can happen to anyone at anytime.Life need not be fair to all . In spite of these bare facts , life is still enjoyable . I have learned that one of the most difficult things in life is unexpected death of a loved one.I never experienced this before.I knew about it but never experienced.It is just terrible feeling at times when I realize that we will not meet again! I have learned that time will heal everything but can take a little more in some cases , mine being the later case! I have learned that right interaction,mutual help,transparency .....among the immediate family members will boost the confidence level of all to face boldly situations like this. Life can be much better this way . I have learned that quality of relationship is more important than quantity,if one has to choose. 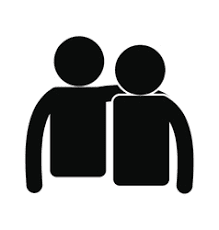 "You are a popular man among friends,colleagues,neighbors and relatives . 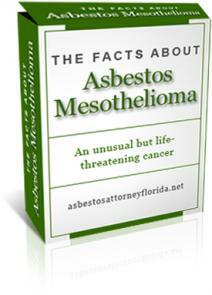 Tested and proven!!" After he is gone,Kochi,the city where we are born and brought up, continues to change drastically. More and more of hypermarkets, multiplexes,international brands of junk food,fashion products,high rising sky line...the metro in the making ......everything is growing except the basic infrastructure which continues to be the same,more or less, when we were cycling in our school days the town which was then limited between the north and south railway bridges!Kerala tries to 'emerge' without the basics-potable perennial water supply, uninterrupted electricity,drainage network,good roads,waste management , health facilities for all - like any other state in India !! Summer,spring and rainy days have come again to Puthoor,KKP Road... Flowers have bloomed again at home garden. Sparrows- Adakka kili- are once again chirping around the house.The 'sherrygoa' mango tree keeps on giving fantastic fruits, if the insects let . Everything is getting back to track once again . Except him!Sooner or later he also will be forgotten. So also me, when my turn comes, whenever it is ...paving the way for the next generations. "That's Life", as we used to say on certain topics , while strolling at ' Mangala Vanam' at times, place I have not visited since he left! My brother has been an ardent fan of western music - jazz , pop, rock , folk , instrumental - since his teens , a rarity among Indians those days. Elvis Presley , Cliff Richard, Englebert Humberdinck, Credence Clear Water Revival...... Beatles , Monkeys, Rolling Stones, Jimi Hendrix , Bee gees , Bony M ....Michael Jackson , Madonna, Spice Girls ......to the latest of 2011, could be Gaga , Rihanna, Adele ! Now I dedicate this song...Some day I will see you again....by Westlife.
" SELL ONLY AFTER 5 PM "
Kerala is a unique state in the country ( India ) by many standards . Most of them are good but few are pretty bad . Most literate state , the state having the best Human Development Index ( a measure for the quality of living), state having the best economic productivity, the state having least communal frictions .... the list can be stretched with further sobriquets. Paradoxically it is also the state where maximum suicides take place, and now Kerala is in the top of the list of drunkards as well - with the highest per capita consumption of alcohol in the country !!! I and Geetha had to drive on the last Thiru Onam day from Trivandrum to Kochi . Onam is the harvest festival of the state and regardless of religion all keralites celebrate it with fervor . Climax of the celebration of Onam is to have the vegetarian lunch on the plantain leaf , rice with a lot of traditional curries , desserts etc eating along with all others in the family. While travelling , seeing lengthy queues in each small town which we passed , we were curious . 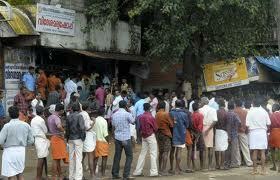 In Kerala , in spite being the most literate state none will practice any queues in public places. Whether it is to board a bus or train, whether it is in hospital, bank or on roads it is the same attitude. Not only now , but from the time immemorial . But while living in another state or country we will be the first to queue up!! (Sorry, we are like that ). 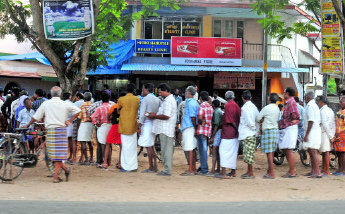 Now coming back to queues which we saw , we could notice that 'all the queues lead to liquor shops'. Town after town it was the same scene . Even on Thiru (main ) Onam day at noon around 1 pm , men are patiently standing in orderly lenghty queues!!! Poor family members , I dont know whether they have to wait for him to have the lunch at 3 pm on a Onam day !!! 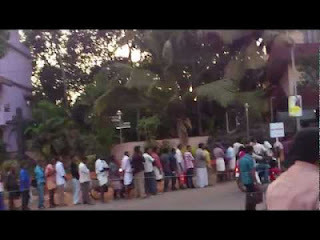 Such queues are not restricted to festivals or holidays , every day esp during evenings . Regardless of religion/ community , all people , through out the state 'participate' in this operation !Unfortunately Kerala has reached the level of problems more than due to 'social drinking' , a state of ' rain or shine we shall have wine' ! Liquor business is monopolised by the Govt run corporation - Kerala State Beverages corporation .Through 340 sales outlets , it operates from 9AM to 9PM , 7 days a week , 365 days a year (except on 1st of each month - Govt thinks of the welfare of salaried people! ) ! Other than this ,there are 600 privately run bars and 5000 odd toddy shops ( local palm wine)!! Coming to Toddy shops, toddy is made of coconut palms . It is a fact known that toddy shops are selling many times higher than what actually could make out of all the coconut trees in the state meant for the purpose, for which the fingers point out to adulteration with synthetic toddy!! Alcohol helps Kerala Govt to run its economy . Booze boosts the otherwise 'remittance economy ' Kerala is famous for , it seems . 40% of the revenue of its annual budget comes from selling booze. Kerala has topped the list with eight litres per person per year while the national average is less than two litres. Poor Punjabi is now a far second .The 'intelligent' malayali now spends almost 3 times for liquor than for their staple food rice in the state ( Rs 7500 crores for the booze, Rs 2800 for the rice !!). Everyone in the state knows that the situation is pretty bad . Each Govt wants to make drastic changes but falls short of it each time foreseeing the huge loss of revenue without which state cannot run now . Social and religious institutions are loud and clear on the subject . National media has covered the subject widely. International media such as BBC has run stories on the subject. Sensing the danger the state may fall into , High Court of Kerala has recently suggested that the sale of liquor to be allowed only after 5 PM ,while considering an appeal by the Govt !! Sadly undeterred ,the self styled ' most literate' , ' most intelligent' , ' most cultured' malayali keeps on drinking ..... other than learning how to form a queue, everything else is bad in this case ! courtesy :photos - google images. RESPECT STARTS AT HOME ! Self respect and respect to others brings respect of others .This fundamental is very true not only in human beings but matters in case of countries as well . Unless Indians don't respect their own currency in India, how others are expected to....Any visit of mine to any Indian duty free shop will trigger this thinking , last being few days back ! Whats is after all a duty free shop ? 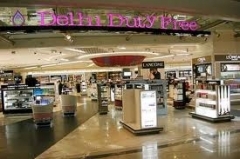 Why Indian duty free shops are different? Everyone knows what , where and why a duty free shop , no doubt . But I am sure the perception about a duty free shop differs from person to person . If one thinks that duty free shops are only for the luxury items or liquor , I have to differ . Even chocolates or toys or souvenirs or fridge magnets are available there. Duty free shops are places where good branded genuine international products are available at the cheapest prices . It is also a place where host country's products of repute are displayed to the outside world . It is not limited just for the rich traveller but common man as well . I have seen very often the rush of the people including the very common expatriates shopping in such places in the airports of Arabian Gulf states. Duty free shops which are located in the departure/arrival terminals after check in and immigration clearance make the buyer feel at ease and select few goodies at his or her leisure time . Window shopping is even better ! In case of tourists who have spent few days in any country , duty free shops are convenient places to spend the excess local currency the tourist might have accumulated with during their stay, to buy mementos , local products or any other goods to take home . But not in India . India will accept all major currencies of the world but for the Indian Rupee !! As if we are eager to say the outside world that our Rupee is not trustworthy !!! Where is India now ? India joined the ranks of the major currencies of the world adapting a symbol for the Rupee in July 2010 . India is a G 20 member . India is a country with a foreign reserve of $ 300 billion plus while economy is growing at a rate of 5-6 % as of now . India is one of the largest 10 industrial giants ( although it lands up at times to total electricity outage in half of the nation due to 'technical glitch' ) . Despite the fact that value of Rupee has gone down in recent months , Indian Rupee symbolises the strength of the economic system and rising prowess which is recognised the world over . But for some strange reason India refuses to accept own currency at own duty free shops !! Interestingly this happens only in duty free shops which is fully owned by the Govt . All other shops in the same vicinity owned by private owners or even some semi Govt , welcome the Rupee. Quite a number of Indian and overseas organisations and handful of members of parliament have raised this issue over the years but not with much effect . Journalists have written articles many times . Civil bureaucrats , who rarely travel abroad or lack exposure to international crowd but controls the ministries , have not given much thought about this , it seems. Under certain conditions Indians on a trip abroad can spend some small monies ($135) in own currency at Indian duty free shops as per a rule made in 2005 . Apparently India might have decided to accept only foreign currencies soon after she became a republic in 1950 , when India was craving for foreign exchange and was begging around the world for financial aids. I did some research on the subject. The fact I could find is surprising . None of the BRIC countries or G10 or G20 countries treat their own currency the way Indians treat !! All these countries welcome their own currency as priority in their duty free shops along with other major currencies of the world (Indian currency not included) !!! China displays the prices only in RMB , while Russia in Roubles , Brazil in Real and Mexico in Pesos.......Some of these countries was in a similar state of what is in India but changed years back . What about local products ? Indian duty free shops displays Indian products such as tea , spices , handicrafts etc . Most of these products the westerner is thought to be after from the time Vasco Da Gama or East India company landed in India . It is fine . But now the international traveller would be equally interested if not more , in world class Indian brands of modern products such as in textiles , leather , computer hardware/software/peripherals... because tea and spices will be available in all the supermarkets of those countries . Duty free shops are excellent places to show case home grown products which are of international standards or intended to be promoted to be so . When India is on a drive to have world class international airports , it is high time that India rise to the occasion . While other countries look at India and expect to take a front seat in the new world economic order , it is high time that India takes a seat. Last week a photo related to ongoing strike of pilots of Air India which was published in all Indian newspapers caught my attention . 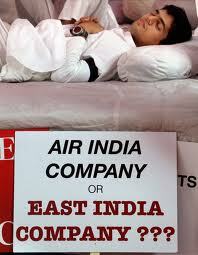 Photo of hunger striking pilot with a ply card - Is it Air India or East India company? Why this comparison? Obviously East India Company stands for corporate abuse, exploitation and monopoly power . Rather than about Air India , the current plight of which every educated Indian knows , my mind tangentially went to the famous/ infamous East India company (EIC)......Wants to share something about East India company which most of us is not aware of or noticed ....from an angle of a business executive having years of international business exposure. 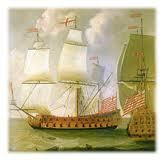 British East India company was formed in 1600 in the private sector . It was the first company to issue public stock , owned by few wealthy merchants in England , 125 shareholders to be precise . The capital was 72000 pounds. The Govt had no shares , not even direct control . The primary intention of the company was not bad , it has to be presumed .To trade with India , China , Far East ....The company will have its ships , export goods anything saleable from England to these lands and take goods such as spices , tea , cotton ,saltpeter ( potassium nitrate -which is a must in making gun powder, which was abundant in China) from the east and sell the same in England with a good margin. The company got an exclusivity by a royal charter .The idea got immediate recognition among most of the lead trading houses of Europe which culminated in formation of many similar East India companies - Danish , Dutch ,Portuguese, French and Swedish- in the following decades - a trend valid even these days . Once a business plan is found successful there will be a lot of copy cats. East India company landed in India in 1608 while the Mughal empire was in power . But it was an empire already on decline . Early trading stations in India for the company were in Surat , Madras(Chennai) , Bombay(Mumbai) & Calcutta as permitted by Emperor Jahangir. 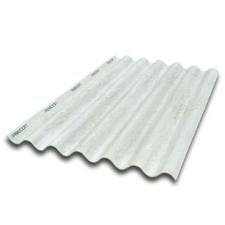 The activities of the company grew rapidly .Company prospered . The sudden prosperity of the owners and the staff of the EIC invited competitions from others from England . By an act that was passed in 1698 a parallel East India company officially named the ' English Company Trading To The East India ' was floated under a state backed indemnity of 2 million pounds .The powerful stock holders of the old company quickly subscribed a sum of 315000 pounds in the new company and dominated the body ! The two companies wrested with each other for some time both in England and India for a dominant share of the trade. The companies merged in 1708 by a tripartite agreement involving both companies and the state . Definitely a forerunner of present day corporate mergers , acquisitions and take overs !! The company became favourites of the rulers to an extent in 1717 by completely waiving customs duty for the trade. Share prices of the company shot up.Then how a business house which didnot have even an iota of malicious ambitions when formed became rulers of India ? EIC was an anomaly without a parallel in the history of the world whether one likes it or not. Started as a small trading firm with little subsciptions of few private individuals . Gradually rose to a commercial body with large resources at its command and then exercising military power , assuming administrative functions , own currency in the lands it traded....finally in the form of a sovereign power! The company wound up in 1858 in the following year of Indian mutiny and thereafter the rule shifted to British empire till 1947. Incidentally how 'smart ' the British were(with all due love and affections to hundreds of my British friends- personal and official ) , when it came to taking out Indian natural resources to London in pre independence days , I had to narrate my personal experience of 1974 . I was then an Assistant Engineer in the Public Works Dept posted at Nilambur , a remote place in Kerala . 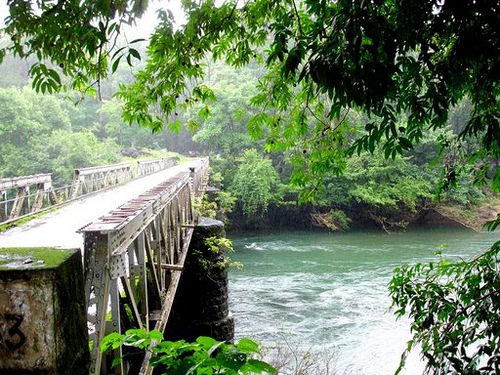 Nilambur is famous for its teak forests . As a part of investigation of new schemes and projects I had to travel in a jeep a lot including forest area , which I used to enjoy since I was hardly 24 then. Once while I was driving in the Nedumkayam reserved forest area about 25 kms away from the HQ, I came up to a road bridge . A very modern steel bridge , which even these days India may miss in many towns. The steel girders were all imported from England .Why such a modern bridge was constructed by the British , probably 100 years back , deep in the forest ( while they neglected many town areas) , I was curious . A very picturesque scenery around . There was a plaque indicating a spot where the engineer who constructed the bridge was buried. He died accidentally while taking a dive to the river near the bridge, but his wife decided to bury him there than taking his body to a cemetery . Only after so many years I had the answer to my own query .The British had constructed good roads and bridges in the forest so that they could take out the teak logs to England . For this purpose during those years , a railway track was also constructed linking Nilambur to Shornur , a major railway junction to this day . And the railway was broad gauge ! A big teak tree fell in the deep forest could be easily transported by road to Nilambur railway station and then by train to Shornur , from there to Chennai .Ships take them to London from Chennai ! Sadly from what is going on in the country about Air India , it seems we Indians have not learned from our own past history!!! World is very small, it seems. It could be a strange coincidence that me and Mr. AJ Overwater, CEO, THE EAST INDIA COMPANY FINE FOODS LTD, LONDON had a formal meeting in my office three weeks back. We were discussing on possibilities of a JV in opening a branded restaurant in Doha ! !